I resisted ebooks until recently, despite my somewhat geeky background. I've been a heavy reader since childhood, which means that books – real books, printed-on-paper books – have been a big part of my life for a darn long time. Reading on a screen of any type was not the least bit attractive to me. I even love the smell of books (especially old books), and I used to love the feel of a book in my hands. Boy, did that change in a hurry. I bought a second-generation Kindle when they were introduced about two years ago. Quite suddenly, my love affair with physical, paper books evaporated. With exceptions that we'll get to later, I now find the idea of reading a printed, paper book about as appealing as, say, watching Avatar on a black and white television from the 1950s. In addition to the Kindle, there are several other choices for ebook reading – and some are free. Ebooks are further opening up the information flow that began with Gutenberg and accelerated so dramatically with the Web. With governments everywhere either censoring the web or gathering the tools to do so, ebooks are yet another way to keep the truth alive, if only because the outright banning of a book is more visible and likely to cause more resistance than blocking a website. Ebooks can also travel outside the web, on CDs and USB drives and by other methods, if it comes to that. Speaking of Gutenberg, Project Gutenberg offers over 33,000 free books (including many in languages other than English) for your Kindle or other ebook device. Ebook reading devices are evolving quickly; a color version of the Barnes and Noble Nook will be on sale by mid-November for $249. Cheaper models from other vendors include the Libris, with a smaller 5" grayscale screen; my local Staples just got these in and are offering them for $119. Better still, you already have an excellent ebook reading device – perhaps more than one. Free downloads of Kindle software from Amazon will turn your Mac or PC, your iPhone or iPod Touch, your Android phone, or even your BlackBerry phone into a surprisingly useful ebook reader. This column reports on my experience with Amazon's Kindle ebook reader and with Kindle software on a Windows PC, an Android phone, and an iPad. I'll further comment on the phone and especially the iPad, beyond the use of Amazon's Kindle software on those platforms. Roughly the size of a very thin paperback book or a pamphlet, the Kindle feels light and – with one of the optional covers – comfortable to hold for extended periods. There is now a third-generation model out, which looks almost like the previous version at first glance but has a smaller body surrounding the 6" screen. The new screen is higher-contrast and offers quicker page-turn. There is also a revised keyboard (including silent page turn buttons, your spouse will be pleased to know), a lower price, and a few other changes. A Wi-Fi only model, the price leader at $139, is available; Wi-Fi plus 3G is $189. Previous Kindles use only the cell-phone network. Amazon pays for the airtime; you don't need a data plan of any type. For Amazon's long page about the Kindle, including specs, photos, and comparisons, see here; scroll down about halfway for links to free Kindle software for your PC, Macintosh, Android phone, iPhone or iPod Touch, and BlackBerry. As Amazon advertises, the Kindle screen is easy to read even in direct sunlight. Despite lack of backlighting, this screen is also easier on my eyes in low light than a paper book; reading in bed with the nightstand lamp on a low setting is more pleasant than with a paper-based book. I have seen the third-generation model, and as claimed, its screen is even better. Battery life is terrific – a week or more in most cases; Amazon actually claims a month for the new model. That low-power e-paper screen pays big dividends here; newer color ebook readers with backlit screens eat battery power much more quickly. Font size, screen rotation, and number of words per line are easily changed. Text search is available. I can't even guess how many times I've wished for that ability when reading a paper-based book. Bookmarks and notes can be added. Moving between books (or blogs, or whatever you're reading) is easy – no getting up and looking for something you need, because it's all right there on your device. For a small fee (based on file size), you can email a document to your Kindle for reading on-screen. (You can also move documents directly to your Kindle from your computer, but only for backup -- they won't show up in the Kindle's Home menu. MP3 files, on the other hand, can be copied to your Kindle and then played by the Kindle as you read). Whenever the mood strikes, you can shop at Amazon from the device and start reading a new book or blog 30 or 40 seconds after buying it. Amazon automatically synchronizes your registered devices, which means a book opens where you left off, even if you were last reading it on another of your devices – your phone, your PC, or whatever. (This can be turned off, however, should you, for example, be sharing a book with your spouse on two devices registered to the same account). Lots of material – classics, material out of copyright, and some new material as well – can be had very cheaply and often for free, both at Amazon.com and from other sources. "Over 1.8 million free, out-of-copyright, pre-1923 books are available," according to Amazon. And Amazon itself has the largest selection of books, blogs (over 11,000 listed at this point), and other electronic media I know of; you certainly won't lack for something to read. Amazon offers free sample chapters of new (commercial) books; no need to buy a book until you are sure you'd like to read it. Many new books by major authors are cheaper in Kindle form than even the paperback price; Amazon is still pushing publishers to use $9.99 or less for new best-sellers but not all publishers or authors are complying with that guideline – and higher prices are generating customer backlash, judging by reader comments at Amazon. Long term, a Kindle might or might not save you money compared to paper-based books. (Rarely, a single Kindle book can save you $50 or more, but not with anything mainstream). Books you have purchased but don't currently have on your Kindle will be found in your Archive, and you can download any of your previous book purchases as many times as you wish and to any of your devices (up to five devices) for no added charge. Deleting books from your Kindle occasionally is useful because of its minimal file management tools. Deleting things reduces the clutter; you can always download them again later if you wish. Text-to-speech is adequate, and a terrific bonus for those who would make use of it – but not all publishers allow it to be enabled in their books. If you are reading a best-seller, you will often find text-to-speech turned off. (Another use for this feature: to read with automatic page-turning, turn the volume all the way down – which makes the device silent – and start the text-to-speech feature; the pages turn as the muted voice moves through the text). Note: text-to-speech is not available, so far as I can see, on Kindle for PC or for other devices; only the Kindle device itself offers this option. I know someone who reads audio books almost exclusively, and while he prefers them to the Kindle's oddly cadenced speech, he is considering a new Kindle just for its ability to read aloud the books he cannot get in audio book form. The web browser is very basic; with the small Kindle screen, no color, and slow screen refresh rate, this won't be your preferred web browser. However, it does give you access to gmail and many other Google services, to Wikipedia, and to many other sites. The MP3 player is adequate but neither as easy to use nor as rich-sounding as an iPod or an iPad (I can't address the new Kindle 3's music quality). That's a shame, since the combination of music and reading is a natural, and perhaps if I were using low-end earbuds, such as come with the iPod (or were I listening to text instead of music), I wouldn't be bothered by the slightly thin quality of the sound. But my guess is that if you care about music and use upscale headphones or earbuds, you won't find the Kindle's MP3 performance to your liking. An aside regarding earbuds: I bought some Thinksound Rain 9mm earbuds after being stunned at the low quality of the standard Apple units, and am happy with them. Friends give them a good review as well; they're not terribly pricey – just over $60 today at Amazon – but they sound warm, rich, and clear. You can certainly spend more and (in some cases) get even better performance, but the Thinksound units do provide a dramatic improvement in sound quality over the earbuds that come with the iPod. There is a 10mm version, advertised as providing more bass, but having tried both I prefer the smaller units – which actually have terrific bass and, to me, a more natural and pleasing sound. Last but not least, the file-management tools on your computer work fine with the Kindle – not for Amazon content, which is encrypted, DRM'd, and not meant to be messed with by the user except via Amazon's own software – but you can use the device as a USB drive via the included USB power/data cable. That means a Kindle works well for daily backup of text and other smallish files. You won't be reading these files on your Kindle – for that, email your document to the device; Amazon converts it to AZW1 format and adds it to your Home menu (for a small charge) – but easy file transfer via normal computer file-management software is a very useful bonus that should be included on any device like this – I'm talking to you, Mr. Jobs. The Kindle interface and keyboard are, to be charitable, clunky. It all works, but you won't find it elegant by any means. Printing isn't possible, as you'd expect from a device created to help Amazon sell copyrighted books in electronic form. Bookmarks and notes on the Kindle are in some ways a poor substitute for being able to browse and mark-up a physical, paper book. Students especially take note. And Kindle books have no page numbers, a consequence of the variety of font sizes available. You won't be able to reference a particular page number in a review, for instance. (The Kindle, including Kindle software on other devices, divides the text into "location" numbers, which are sometimes useful). Page-turns involve a quick black-white flash on the e-paper screen; this is reduced on the new Kindle 3 but some people still find it an issue. I quickly got used to this effect and am not bothered by it, but . . . you might feel differently. The small screen and no color make a 6" Kindle unsuitable for many textbooks. Charts, graphs, and pictures are hit-and-miss in legibility. You can zoom the image to full-screen, which may or may not be helpful. No further zoom levels are available. The standard Kindle screen is too small for magazines or newspapers (although they are available). Amazon addresses this with their larger DX model, which has a 9.7" screen and a $379 price tag. Bottom line for the Kindle device: The Kindle is excellent for reading fiction and non-fiction books and blogs, unless they include images or fancy formatting (in which case the Kindle may or may not be useful). Anything with plain text – no fancy formatting, few graphics of any kind – works great. For such material, the Kindle device is so much better than traditional, paper-based books that you'll never go back. I cringe at the thought of reading, say, a novel in an old-style book now. For newspapers, magazines, graphics-intensive books, and textbooks, however, the standard-size Kindle device is a poor choice. 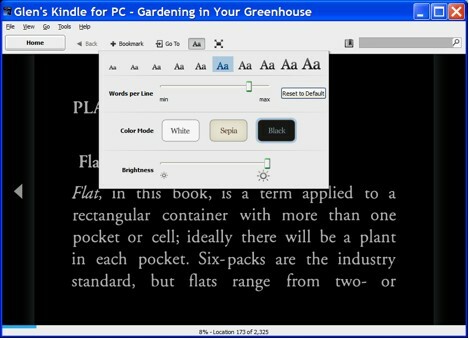 A free download from Amazon, this software brings most of the benefits of a Kindle device to your laptop or desktop screen. In the process, you naturally get color plus more screen real-estate to read on. The positives and negatives of using Kindle software on your computer are mostly as you'd expect: Searching, bookmarking, and most other functions show up, but without the limitations of the small, grayscale Kindle screen. Color images do show up in color, and the software works well; I've had no problems with it at all. Best of all, you have access to Amazon's Kindle store – mostly; see details below. On the other hand, full-page-at-a-time scrolling feels wrong when using a keyboard, and pages change (using the arrow keys or PgUp/PgDn) suddenly instead of sliding gracefully and controllably sideways (as on Kindle for iPad or on Android and other phones). Oddly, no two-column view is offered. 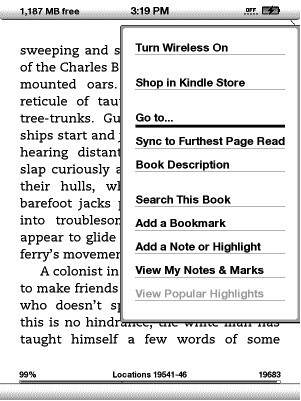 (Kindle for Mac does offer two-column view, as it happens). Also, Kindle for PC offers no change in page orientation, which might be an issue for laptop users. There is also no zoom or rotate for images. Perhaps the biggest negative here (and one you might not expect) is the lack of text-to-speech. Furthermore, the Kindle software prevents copying text to the clipboard. 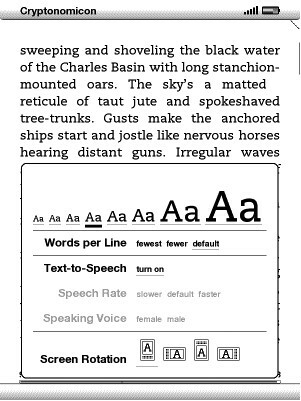 Stand-alone text-reading programs are unable to read Kindle documents. Another surprise: Blogs, magazines, and newspapers that you've subscribed to are only available on your Kindle device – and magazines and newspapers are non-viable, at least to me, on the standard 6" Kindle. Unlike your books, periodicals and emailed documents do not show in your Kindle for PC Archive, and magazine subscriptions cannot be sent to your PC, Android, iPad, or other Kindle software platforms. I hope this changes, because magazines and newspapers are just miserable to use on a standard Kindle, but could be terrific on a larger screen with color. Bottom line on Kindle for PC: I can't even imagine why you would not have this free software on your computer; it isn't my preferred reading method but it is very handy for reference and other material at my desk, and I can't see any downside to installing it. If you don't have or can't afford a Kindle or a smartphone, this is a great way to get access to an avalanche of free books, as well as to the zillion or so books that Amazon sells. The reading experience is comfortable and the software is, for the most part, pleasing to use. Among the many things a smartphone can do is run Kindle software – which seemed a silly thing to do until I tried it. As it happens, I find reading on my Android phone pleasing and often useful. With Kindle on your phone, you can read on your smartphone in the dentist's office even if you didn't bring your Kindle. And yes, it works well and the text is quite readable. I find swipe-to-turn-page on my Android phone so natural that I'm annoyed that my Kindle device and my Windows PC require a button press or mouse click. Holding the phone with one hand and swiping with a thumb works fine on my HTC Desire – works, in fact, better than on the iPhone, where the software seems to require more (or perhaps more rapid) movement to do the job. Bottom line for Kindle on your phone: Kindle for Android (or iPhone, or other smartphones) is, all by itself, a strong reason to get a smartphone. Of course, with such a device you can also send and receive email, surf the web (within the limitations of a very small screen), play games, take photos and video, take voice notes or dictation, and use apps for navigation, medical advice, and many other things. The free Kindle app makes your smartphone just that much more useful – and you may find that you prefer reading on it to using old-style paper books. I certainly do, although there is another device that provides an even better reading experience: the iPad. The iPad provides the best reading experience of the devices covered in this review, hands down – if you have a stand or can otherwise avoid having to hold the thing for more than a minute or two. The iPad is heavy, at least compared to a real book or a Kindle. In particular, I find Apple's multi-touch screen, including especially the swipe-to-turn-page function, absurdly satisfying on this device. The iPad's 9.7" screen feels just right for reading text – generous but not oversized. (For web surfing and for writing more than a few sentences, it actually feels a bit cramped, although far more usable than a smartphone's). The iPad also shows movies and other video (and does so well), plays music, surfs the web, handles email, and connects to an App store with a vast number of programs, from games to desktop-style productivity software. Multitasking is famously absent (for now) but in fact you can read in the iPad Kindle application while using the iPad's included iTunes app to listen to music. The sound quality is fabulous, assuming you are using decent earbuds or headphones. I should mention that Apple has its own bookstore and reader app: iBooks. 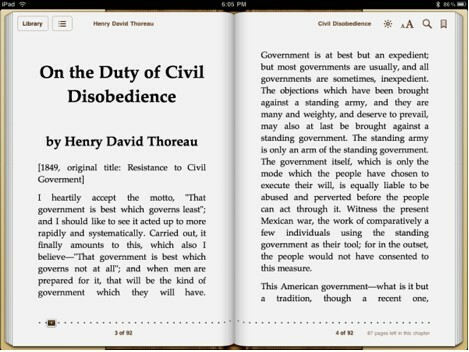 Like Kindle for iPad, iBooks is free. But I find the Kindle software so pleasing, and the shopping experience at Amazon so much better than at iTunes, that I can't recommend iBooks. Plus, when I finally installed iBooks (in order to subscribe to a magazine, which Amazon won't deliver to my iPad but only to one of my actual Kindles), I found that the magazine is only available at iBooks in . . . Russian. I don't read Russian. 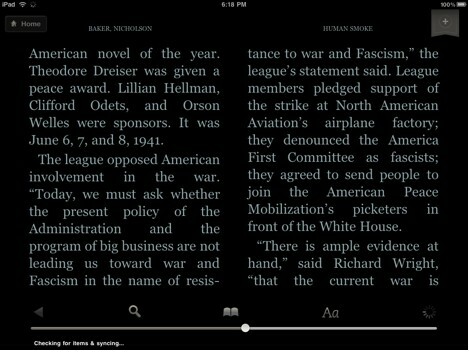 Also, the page-turns in iBooks are animated to resemble a book's pages turning – and the animation is, to me, more distracting than the black-and-white flash between pages on a Kindle device. In contrast, Kindle-app page-turns are smooth glides, moving the entire screen to the side as a new page slides in (on an iPad or smartphone); to me, at least, the Kindle approach is much more natural. Amazon also offers a vastly larger library than iBooks and (in my opinion) a much easier shopping experience. For whatever reason, iBooks has yet to catch on in a big way. In contrast, Amazon's ebook business is booming – the company now sells more ebooks than hardbacks for a given title by an average of more than two to one. Nothing is perfect, and the iPad has its drawbacks. In particular, the iPad is heavy as a brick (especially with a decent, aftermarket cover) compared to the Kindle, and much larger as well – enough so to make the iPad feel less wieldy and comfortable. As with the Kindle, you'll want (need, in my opinion) a good cover – both for protection from bumps and such and to provide a secure grip on what is a rather slippery device. Most covers will act as a stand in some situations. I also use a regular bookstand occasionally with my iPad. Like anything with a backlit LCD screen, the iPad is not a good choice for reading outside during the day; you'll see glare instead of text. Fingerprints are an issue on the touchscreen, so you'll want a small cloth (as you'd find at any optician's) for wiping the screen. Battery life is merely adequate; better than most laptops, yes, but heavy use (including video, email, web surfing, and so on) will deplete the iPad in one day. Like the iPhone, the iPad is too elegant to have actual buttons for most functions (there are a few buttons, mostly on the perimeter of the device, but PC-centric users will be mystified at first). There isn't anything visible to show newbies how to bring up a menu, close an application, or access various functions of any given application. This problem fades with time, but I recommend one of the many aftermarket manuals. A related problem is that the multi-touch screen sometimes makes it easy to select a function (or a webpage link in the browser, for instance) by accident. Smartphone users will be familiar with the problem. Insults and restrictions: This isn't an issue for Kindle on the iPad, but anyone considering the purchase of an iPad should know that Apple hobbles this device even more than it does other products, and in ways that will become an issue for most users. Like the iPhone and iPod Touch, the iPad is restricted to applications you can find at Apple's app store – which does offer a very large and wide selection, including apps that take advantage of the iPad's unique qualities – but shopping elsewhere is not supported. Disk drives? None included; none supported. USB ports? Nope. You might think that the $29 "camera connection kit" (two dongles; one for USB and one for a camera memory card) that connects to the non-standard USB slot used for charging and synching would allow for moving files to and from the iPad, but no: the iPad checks the USB stick and if the stick is not from a camera, it doesn't exist. The user cannot even see, much less transfer, anything other than the allowed camera files. Nor can you use a USB printer (or any printer*), mouse, or other USB device. 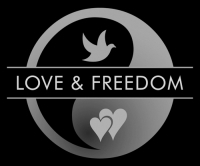 This level of restriction is very annoying – and there's more. (* iTunes offers apps that may or may not let you print to Wi-Fi-enabled printers or in other special situations, "but many of them are buggy or do not work at all," according to the previously mentioned and linked iPad Survival Guide. User comments at the app store support that characterization). 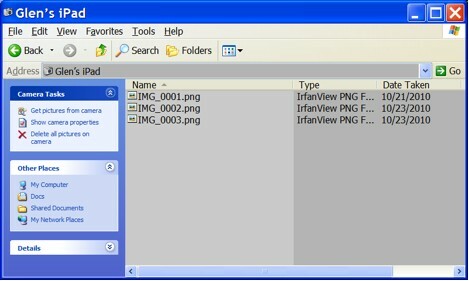 Windows XP's view of the iPad; note the lack of anything but these three image files (which are screenshots I took of my iPad's screen); no folders, no way to navigate anywhere else on the iPad and – although this doesn't show in the image above – no way to drag-and-drop anything from your PC to the iPad. Even getting this screen to show up took some research; the iPad is far more locked-down than even an iPod. For an example of how all this matters in the real world, see My iPad Finally Let Me Down by Joel Johnson at Gizmodo.com. Of course, if you have some free time and are willing to live dangerously, you could jailbreak your iPad, and then you might see something like this (link is to image of OpenSSH screen on an iPad, from Gizmodo.com) when you connect it to your PC – something like what a file-management utility on your computer might show on a Kindle. But otherwise, Apple has you hogtied and blindfolded when dealing with your iPad, and in ways that can turn a simple task into a multi-hour frustration. The idea that users should not be allowed to manage, print, or even see their own files and folders on their own device is so creepy, so authoritarian, and so obnoxious that – at the very least – you should understand Apple's bizarre and needless restrictions before spending your money. I bought an iPad because I have a project aimed at this device in particular. In addition to that, I am enjoying the iPad when using it to read, to watch video, or do a number of other, mostly passive things, but file management and content creation are another matter entirely. Had I bought an iPad to use as a laptop replacement – for working on the road, say – I would not be happy with it. But, again – getting back to the main topic of this review – none of those restrictions affect the iPad's usefulness as a Kindle platform. For that, the iPad is excellent, and an interesting glimpse into a new product category as well. Bottom line for iPad: Apple's iPad is the Rolls Royce of e-book readers – hefty and expensive but sleek, powerful, loaded with features, and (aside from the issues mentioned above) decadently enjoyable. As a Kindle platform it provides by far the best experience of the devices I have used, assuming you don't have to hold it for a long period while reading. The iPad also has much else to offer, but be clear on its limitations, which go well beyond what even experienced Apple users might expect. For those considering an iPad, one of the new MacBook Air models might be even better choice -- Kindle software on this machine is nicer to use even than on the iPad, but price will be an issue for most people. Even the smaller of the new Air models has a larger screen than the iPad (11.6" versus 9.7"), and of course it has a physical keyboard – which also acts as a bookstand while reading. You can add a physical keyboard to the iPad via Bluetooth or a dock, but the MacBook offers more storage (and, like the iPad, it uses a solid state drive), fewer user restrictions, and more powerful applications. The iPad can run a version of the iLife programs, but file-management issues alone would keep me from recommending them on this device, even with an external keyboard. The iPad is designed for media consumption (especially books, movies, magazines, YouTube, and – less wonderfully, because of just-a-bit-too-small screen size – web surfing) but for any actual work, the iPad is not a good choice. Finally, if you are on a budget and don't have a suitable smartphone or other portable device to run a Kindle app, consider the humble netbook ($250-$300 and up). Remember that even a smartphone screen works fine for reading novels or plain-text nonfiction, so a netbook – with its much larger screen – will definitely do the job, although short battery life is a common weak point. And, with most netbooks, you've got enough power and storage to run major applications like Word, Excel, and (maybe) Photoshop. You've got the web, probably a video camera, USB ports, and – well, pretty much everything computer users take for granted nowadays. Netbooks are also excellent emergency backup for your main machine. Conclusion: Amazon wasn't the first with an ebook reader but the company has done almost everything right in this market, and in the process transformed the ebook into a monster that is devouring the traditional book industry. Amazon's Kindle device and Kindle software are a pleasure to use, far more pleasing than physical paper books, and the few negatives (lousy file management, DRM, and a few ergonomics issues) are simply overwhelmed by the positives. Also, the shopping experience at Amazon is top-notch and so is customer service (skip the online time-wasting and dial 877-453-4512 for Kindle support, which has been excellent when I've had occasion to use it). A disclaimer: not only might I have left something important out or gotten something wrong, but everything discussed here can, and probably will, change as the software and hardware evolve. Features will be added and dropped, hardware will continue improving, digital rights management issues will get worse (if the corporations get their way, or better if the customers get theirs), and new competitors and products will emerge. The ebook world is still young, and we all have front-row seats to watch the evolution of this new information-delivery system. Thanks for the review, Glen. I've been thinking of getting a Kindle myself, and your info here will be a big help. Downloade free Kindle PC, and bought Kindle fire, it lets you access e-mail, facebook and a few other dodads i don't employee, but I sure have obtained batches of books, for free, some, .99, 1.99, ets. Some books are no different in price than the hardcopy. I never believed I would enjoy such a device, but you can highlite, make notes, bookmark pages. It is incredable and I love mine. 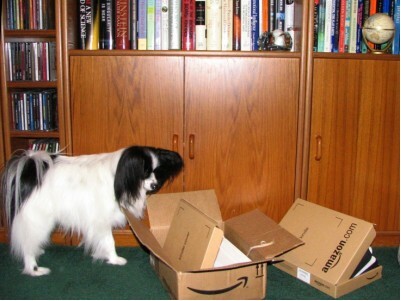 If you have problems with it, you send it back to Amazon and they just simply replace it, no repairing.